Dottie McHenry Rabb, 97, of Benton passed away peacefully on Wednesday, June 27, 2018, surrounded by loving children and grandchildren in Geisinger Hospital. She and her husband, Donald Drum Rabb, recently celebrated their 75th wedding anniversary in April. Friends and relatives from across the country attended the affair at Benton Christian Church. Dottie and Donald enjoyed a very special day seeing and speaking with these precious friends. 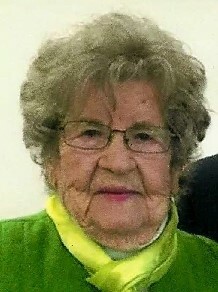 Dottie was born on her family farm, Oct. 10, 1920, near what is now called Zaners in Benton Township. She was the second of five children born to Llewellyn Dyer McHenry and Mary Ellen Thomas McHenry. Firstborn was Jack, then Dottie, followed by Betty Zane, then Thomas Jules, with Patsy the last. Dottie was very proud of her Scotch/Irish roots. She was the eighth generation of John McHenry who was the original immigrant in 1739 from county Antrim, Ireland. His son, Daniel, settled in Stillwater, Fishing Creek Valley, Pa. Because of her roots, she became a member of both the DAC and DAR — Daughters of American Colonists and Daughters of American Revolution. Dottie is survived by her devoted husband of 75 years, Dr. Donald Drum Rabb of Benton. Dottie and Donald were always a team. If you found one, also the other. She was a helpmate in all their endeavors from housekeeping, raising three children, typing Donald’s dissertations for a master’s degree and doctoral degree, camping, fishing, and best friend. She was never too busy to entertain guests that “just happened by” and made them welcome no matter what other projects may be in the works. Her love for learning spanned the earth. She was a living example of the National Geographic spirit. Dottie soaked up the cultures and landscapes seen on their many trips. Her passion for people of any culture was boundless. Her love of learning inspired her children to care for people and our earth. Dorothy Ann “Dottieann” was born in 1948. Robert McHenry Rabb was born in 1950. James “Jamie” McHenry Rabb was born in 1958. There are nine grandchildren and 18 great-grandchildren. Dottie belonged to many organizations, setting a great example for civic affairs, giving through volunteering, as well as, faith and love of her church. Among them are: Benton Christian Church, American Red Cross, American Heart Society, American Cancer Society, United Way, Columbia County Historical Society, Columbia County Child Welfare Board, Bloomsburg Hospital Auxiliary (25 years), Order of the Eastern Star, DAR and DAC. After all the organizations, societies, or groups came entertainment. Dottie shared husband Donald’s passion for golf and became winner of the club championship at Mill Race. Dottie belonged to many card clubs. She loved to entertain and would invite people from all cultures to her home. Dottie McHenry Rabb lived life to the fullest. It is with gratitude for that life and her husband Donald that kept her sustained for 97 years.